Christmas puts parents in a tough spot. We love our children. We want to give them good gifts. 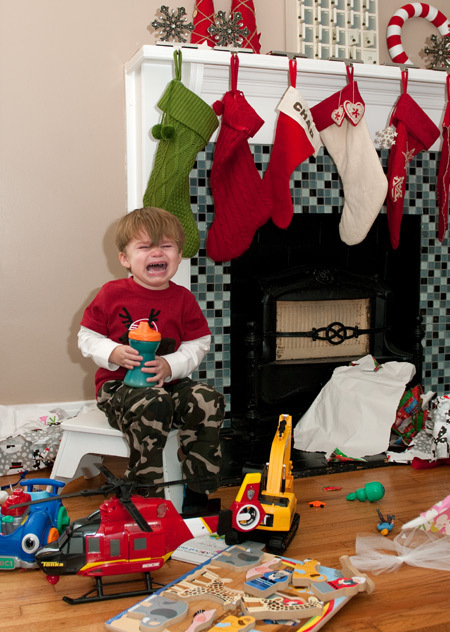 We enjoy their eager anticipation and exuberant gift opening on Christmas morning. And yet as Christian parents, we know there is a dark side to gift giving: greed. All of the presents can seem little more than brightly wrapped packages of temptation. There are temptations to selfish delight or despair, depending on whether or not our children got what they wanted. Greed can take hold, turning what we intend as a blessing into what feels like a setback in our parenting. So how do we give generously and squash greed at the same time? We girltalkers did some brainstorming and idea sharing and came up with ten ideas to get us all started. 1. Be Intentional. Greed won’t go away on its own; we’re gonna have to apply some parental elbow grease to this one. And it’s not a one-time thing, like “Do you remember the year we got rid of Christmas greed?” We’re going to be dealing with it for a while, so we have to resist the temptation to get angry or discouraged if it doesn’t seem like our efforts are bearing fruit right away. 2. Talk a Lot. Deuteronomy 6 is a great Christmas passage. We need to talk to our children about greed and gratefulness and what it means to glorify God at Christmas. It’s tempting to give up, because our instruction often seems to go in one ear and out the other, but we are called to be faithful. Q. What is better than Getting? Q. Why is it better than Getting? A. Because that’s what Jesus did. 3. Make Christmas Memories. Christmas traditions help direct a child’s anticipation toward activities and memory making and not only gift getting. This is one reason we love to celebrate Advent: it is a daily reminder that we are waiting for more than presents under the tree. Cookie baking, Christmas light viewing, and story reading all serve a similar purpose. 4. Make Christmas Giving Lists. In addition to Christmas lists for Mimi we have our kids make lists for what they want to give to family members. Then we let them loose in the Target dollar section to buy presents for their siblings and Daddy and Mommy. This is one of their favorite Christmas traditions, and it is fun to see their excitement channeled toward giving and away from getting. 5. Read Christmas Giving Stories. A great addition to Christmas story time: books that highlight the joy giving such as Little Women, The Gift of the Magi, If You’re Missing Baby Jesus,Christmas Day in the Morning and many more. Powerful stories can help awaken children’s imaginations to the magic of giving. 6. Give to People in Need. Involve your children in giving gifts to those who are in need or who are suffering at Christmastime. We enjoy buying presents for newly adopted children or contributing to a family’s adoption, but there are countless opportunities at Christmastime to give locally and around the world. Giving to others helps children take their eyes off themselves and understand how much they have to be grateful for. 7. Give the Gift of Experience. Along with toys, you can include gifts of experience under the tree: books, magazine subscriptions, memberships to a local museum, tickets to a special event, lessons for art or music, or (my favorite) a family trip or outing. Over time your children may come to anticipate these gifts most of all. 8. Minimize Temptation. In other words, hide the Christmas catalogs. Avoid spending long hours in the toy section at Target with your child. Limit exposure to holiday commercials. Redirect conversations that begin, “Do you know what I want for Christmas?” But don’t mess with the grandparents. Do the hard work of parenting so that Grandma and Grandpa can have the joy of being as generous as they desire. 9. Develop a Gift Opening Strategy. We like to open gifts slowly, one person, one gift at a time. This takes a while, but the slow pace helps restrain greed and promote gratefulness. We are training our children to pay attention when someone else is opening a gift and enter into their joy. And we also insist that our children give hugs and kisses and “big thank you’s” after opening each present. Having a strategy for gift giving that encourages patience, gratefulness, and a focus on others can counteract the greed that wants to own the day. 10. Cultivate Christ-like Character. We may have outgrown a childish greed for presents, but we as parents are still tempted to approach Christmas selfishly, for our own comfort or gratification. We need God’s grace to help us serve selflessly, give generously, parent patiently, and grow in passion for our Savior at Christmastime. As we grow to be more like Christ who “came not to be served but to serve, and to give his life as a ransom for many” (Mt. 20:28) we will encourage our children to do the same.